It was a short message from #thewatchnerd asking me if I knew that there was a certain Bulova re-issue that lead to this post. Did I know? No I didn’t, but did his news pique my interest? More than just a little. 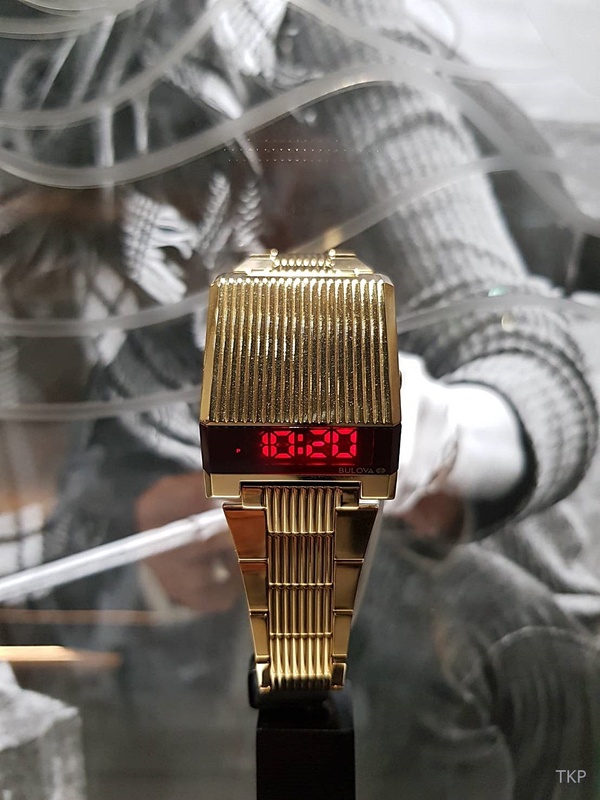 Part of their ‘Archive Series’, Bulova’s new ‘re-introduction of the 1976 edition’ (as they call it) of their trapezoidal-tastic Computron LED may be just what I need to scratch that particular watch itch that I’d put aside. The funk and fun of the original, but without the issues associated with the originals due to the simple passage of time, moisture, and their effects on the electronics. The year of 1976 was notable not just for the introduction of the Computron name and this particular LED driver’s-style Computron which is the forefather of today’s new model. The same year also saw the launch of Bulova’s Accutron (ACCUracy and ElecTRONic) quartz movement watches for men. It is important to note that the Computron name covered a wide range of digital models and that a number of Driver Computron LED variants for both women and men were released. The original Computron driver’s LED had the time and date. This new one has an added dual time zone function. You press the crown button in succession to display the time, seconds, current date, and the second time zone. Are these for everyone? They weren’t back in the mid 1970s and they probably aren’t going to be now, but for those keen on the original, Bulova fans, and for those who simply for aesthetic reasons like that period or are into the whole retro-futuristic look, it will be of interest. At the very least, it will introduce it to a new generation of watch lovers. There are three variants for this updated Driver’s Computron LED. The gold-plated version is 395 USD/ 249 GBP, and the black IP and stainless steel versions are 295 USD/ 199 GBP. They come on either a bracelet or rubber strap (the black IP). The stainless steel version is the only one with a blue LED display. You may recall a post in 2016 about Bulova’s updated re-release of the watch Apollo 15 commander David Scott wore on the third of his 1971 moonwalks. Scott had the Bulova Chronograph prototype with him as a personal backup, unbeknownst to NASA. The brand had asked him to test it to see how it would perform during the Apollo 15 mission. It was an unauthorised watch, Omega having beaten Bulova in the trials to become the official NASA ‘space watch’. However, Bulova did end up having a decade-long partnership with NASA at that time, providing satellite missions with Accutron tuning fork technology. All up, they were part of 46 missions of the U.S. Space Program. All timekeeping instruments, including instrument panel clocks on NASA’s manned spacecraft missions leading up to and including the first moon walk on July 21, 1969, were equipped with Bulova Accutron tuning fork technology. Not only was Bulova a part of the on-board systems, but Buzz Aldrin and Neil Armstrong left a Bulova timer on the Sea of Tranquility to aid data transmission back to Earth. As you can see in these advertisements from the period, it was a important part of their marketing at the time. For those who are curious, Bulova and Buzz Aldrin did a limited edition (1,000 pieces) version of the Accutron ‘Astronaut’ model and a regular production Accutron ‘Eagle Pilot’, both with Aldrin’s signature engraved on the back. He was even selling them on his website.